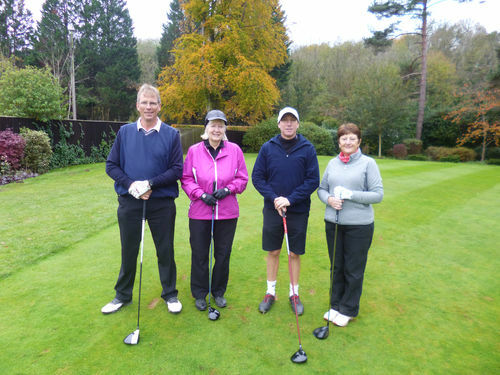 Captains' Drive -In - 4th November 2018 :: Gerrards Cross Golf Club is considered one of the most attractive courses in South Buckinghamshire. Incoming Men's Captain, Colin Sawyer and Ladies' Captain Jennifer Locke joined forces for the Drive In ceremony as 2019 will be the inaugural year for equal status at the club. A bonus for members who attended (apart from the Bucks Fizz), two chances to win the Drive In distance lottery. 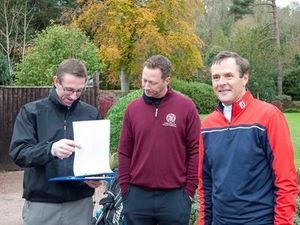 Adam Grint, General Manager and James Torr, President officiated for the distance measurement. 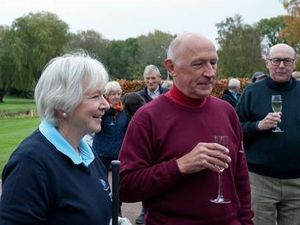 The winners this year were Sue Hughes (160m for Colin) and Graeme Wilson(111m for Jennifer), each took home a bottle of Champagne. 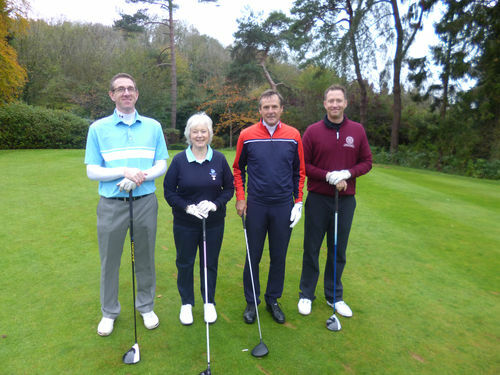 A change of format this year as the Captains invited other members to join them for an informal match between the Men's and Ladies Captain's teams. The Ladies Captain's Team won the friendly match 3-1. Highlight for Jennifer a rare eagle 3 at the Par 5 2nd hole with her partner Lewis Atkinson, Head Professional. 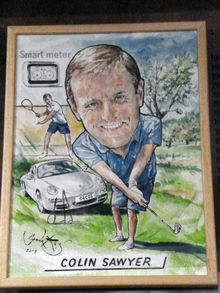 The Captains, members and guests gathered later for the unveiling of Colin Sawyer's caricature portrait in the Burrows Bar. As is custom Vice-Captain Henri Botha gave a brief address and drew the curtains to reveal another Gordon King masterpiece. Our thanks to Gordon from the club who kindly attended the ceremony.